Note of transcriber- Although this event took place in Co. Armagh, it concerns 20-30 people from the Parish of Killyman.. As they lived so near, many people of the 2 counties, knew each other. The distance from Lieut-Col. VERNER's home to Maghery is 2 ½ miles. It becomes my duty, having the honour of holding His Majesty's commission of the peace for the counties of Armagh and Down, to make to you a report of a very serious outrage, which took place at a small village on the borders of Lough Neagh. The village is situate on the river of Blackwater, which divides the county of Armagh from Tyrone; the village being in the county of Armagh. There is a ferry across the river at the village, and about 3 miles higher up the river, there is a private toll-bridge called 'Verner's Bridge'. It appears a number of Orangemen marched from Killyman, in the county of Tyrone, over Verner's-Bridge on Friday the 19th instant, and through the village of Maghery, to the Banfoot. On going through the village, the inhabitants of which are all Catholics, the Orangemen were joined by the inhabitants who asked for several tunes, which were readily played by the band, which pleased the inhabitants so much that they walked with the Orangemen to the Banfoot, nearly 2 miles. The Orangemen crossed the Banfoot ferry and the inhabitants of Maghery returned home in high good humour. The Orangemen proceeded to the house of a man called Richard WILSON, and being there joined by many brother Orangemen of the townland, they proceeded to hold a lodge, or as it is called ' a black silting'. John RICHARDSON of Killyman, acted as master, and Alexander MURPHY, junior, acted as secretary. The party remained together all night, in the morning it blew a perfect hurricane, and the boats could not cross the ferry at the Banfoot and the Orangemen were detained until the gale abated. They arrived at the village of Maghery about 10 o'clock, and were met by some of the inhabitants, who asked them to play 'Patrick's Day', which was refused and the band immediately began to play 'The Prussian Drum or more Holy Water', upon which a skirmish took place. The Orangemen were beaten, their drums broken, and some hats lost. The Orangemen retreated to Verner's Bridge, and it so happened that an inspection of Colonel VERNER's yeomanry corps, was held that day. 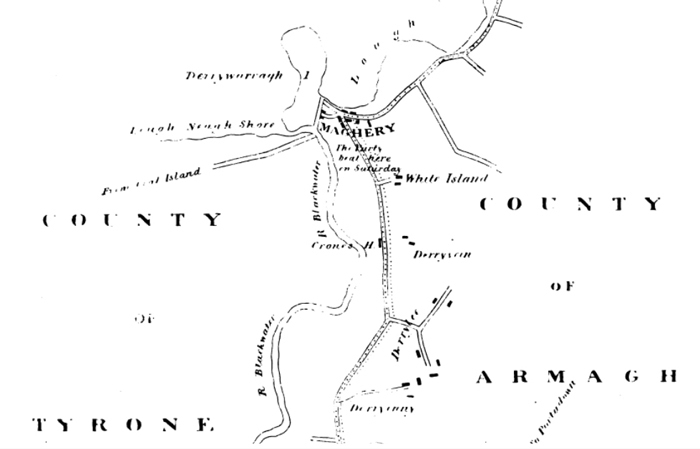 The Orangemen applied to the corps to come with them to help to wreck Maghery, this however, was prevented by the interference of Colonel VERNER, and the officers of the corps, and the beaten Orangemen returned home. On Monday morning a large body of armed men marched with drums and files past the house of a Mr BORETREE, who is, I believe, an officer in the Killyman yeomanry corps, who states he remonstrated with the party, who declared their intentions to wreck Maghery. Not being able to stop them, he rode off towards Verner's Bridge, and called upon Captain LLOYD, of the Killyman yeomanry corps, to interfere to stop the party, and rode on to the house of Colonel VERNER to apprize him of the party; the colonel immediately repaired to the bridge and locked the toll gate, to prevent the party from crossing the bridge, the colonel then asked the men what they wanted, and they said their drums had been broken at Maghery, and they had been beaten, and they would have satisfaction. Colonel VERNER said the damage should be paid, but the mob said " We must know that the Maghery people do pay" and deputed two of the party to go to Maghery with Colonel VERNER to get paid, the others agreeing to disperse and go home. Colonel VERNER when he had got the two men, who were to accompany him, went to his own house to get his breakfast and as soon as he was gone, the armed party broke over the gate, and proceeded to Maghery. Colonel VERNER overtook them upon the road, and as he states, did every thing in his power to prevent the party from proceeding, but without effect. On the party marched, and when they arrived at Maghery, commenced operations, by breaking the doors, windows, and furniture of the inhabitants, in fact, completely wrecked the village in the presence of Colonel VERNER, and some of the constabulary police, and having done, marched off with drums beating, in regular order, Captain LLOYD, at their head, and the rear brought up by Colonel VERNER. No attempt was made by Colonel VERNER, though a magistrate of the counties of Armagh and Tyrone, to take a single prisoner, nor did he bring one of his labourers to assist in intercepting the return of the party over the bridge, as he might have done, but allowed the party to march in triumph over the bridge, and home to Killyman, nor has a single individual been arrested or held to bail. A meeting of magistrates was held on Thursday at Maghery, present- Mr ATKINSON of Crowthill, Lieutenant Colonel VERNER, Lieutenant colonel BLACKER, Mr HARDY, Mr FORDE, Mr ALGEO , Mr WOODHOUSE, and myself. Only three or four of the inhabitants could be got to come forward, and not a single individual was identified, or a name mentioned, though the party marched publicly with drums and files in the open day, through 3 miles of the county of Armagh and 2 or 3 of the county of Tyrone. I have given as full, and as an impartial report, as in my power, and I have given the names, in order that his Excellency may have no difficulty in getting an investigation, set on foot, if it is his pleasure so to do, and I am sure if the recollection of the transactions of Glenoe are not effaced from his Excellency's memory, he will feel it due to the peace of this district to have a full and careful investigation into this transaction. I need scarcely add if any services are in any way required, I am ready, and willing, to obey any orders it may please his Excellency to give upon this or any other subject connected with the peace of my neighbourhood . I have the honour to transmit herewith a statement of an outrage committed at Maghery in this county on the 22nd instant, carefully compiled from the depositions taken at a meeting of magistrates held on the spot on the 25th instant, and entrusted to me for that purpose. These depositions remain in my hands, should they be required; the difficulty of procuring evidence caused them to be taken with such a want of regularity, as to the consecutive order of facts, that it is conceived the enclosed statement will be the best mode of bringing the transaction, in all its details and bearing, at once before the eye of His Majesty's Government. I regret to say that I do not consider the state of public feeling in this part of the country improved. Statement relative to the Outrage committed at Maghery, county Armagh, on the 22nd November, compiled from the Evidence taken on the 25th instant, before the under-named Magistraies viz Joseph ATKINSON Esq. Senior, J.P. in the chair, James FORDE Esq. Roughlan, Curran WOODHOUSE Esq. Portaduwn, Lieut-Col. W. VERNER, Churchhill, William ALGEO Esq. Armagh, John HARDY Esq. Loughgall, Lieut-Col. W. BLACKER Carrick, Hon. E. WINGFIELD Bunburt, W. J. HANDCOCK Esq. Lurgan. The appearance of the village being sufficiently demonstrative of an attack of the most destructive kind, having been made upon it almost every house being more or less damaged, windows broken, and furniture destroyed, the magistrates proceeded to collect such evidence as might throw the best light upon the transaction, as well with regard to its origin as perpetration; in this they met with considerable difficulty, from the circumstance of the inhabitants of the village having nearly all withdrawn themselves, though notice had been given them of the intended investigation; nor could the exertions of Mr. ALEGO, agent to Lord Charlemont, whose property the place is, procure the attendance of more than 2 or 3 of them. The general facts of the entire affair appear, from the evidence, to be as follows; On the evening of Friday the 19th, a party of from 20 to 25 persons (Protestants) from the adjoining county of Tyrone, proceeded through Maghery to the Banfoot, distant about 2 milcs where they remained all night. No dispute or collision of any kind appears to have taken place on Friday, on the contrary they appear to have been escorted along the road, by several of the village people; they had with them some drum and fifes which they played by the way. They reached the village again on Saturday on their route homewards. It does not appear that there were any party tunes played by them until an inhabitant of the village (James McGEARY) desired them to play Patrick's Day,which they offence at and commenced playing a tune called 'The Prussian Drum'. A man Joseph CAMPBELL desired them to desist and as it is stated, broke their drum; a skirmish ensued and the party were driven out of the village some of them severely beaten and with the loss of hats, drums, &c.
On the morning of Monday the 22d Mr LLOYD of Killyman, county Tyrone, was informed by his servant that a body of people were coming along the road near his house, on their way to Maghery for the purpose of destroying it, Mr LLOYD met the party on the road and endeavoured to stop them; they told him that their object was to get their drums repaired and that done, they would return home peaceably. Mr Lloyd then returned to his house and mounted his horse in order to proceed to Colonel VERNER at Church-hill; on reaching Verner Bridge he found Colonel VERNER there, that gentleman having been already apprized of the approach of the party by a respectable person from Tyrone, Mr BOUTRIE. The toll-gate was locked and Colonel Verner was addressing the party then on the bridge. Colonel VERNER proposed that two of their number should be sent to Maghery, and that he would accompany them with a view to settle matters, this they agreed to and the two persons were directed to proceed with a sergeant of police to Maghery. Colonel VERNER accompanied by Mr LLOYD went home for his horse in order to follow them. As soon as Colonel VERNER was gone the party forced their way over the bridge and were overtaken by Colonel VERNER and Mr LLOYD on the road to Maghery. On Colonel VERNER expressing his great displeasure at their breach of agreement they consented to stop until he and Mr LLOYD should return from Maghery; the two gentlemen then hastened to the village, when Colonel VERNER called upon such of the inhabitants as he could find to come to him; a few did so and while he, Colonel VERNER was speaking to them, he observed the party at the entrance of the village. He requested Mr LLOYD to stop them which that gentleman attempted to effect, but the crowd pressing on, Colonel VERNER ran down to his assistance, remonstrated ,and read the Riot Act, but to little purpose, for though it appears that the main body remained on the road a considerable number detaching themselves from it, made their way into the village by the fields, and commenced and carried on the work of destruction. Colonel VERNER appears to have used every exertion to put a stop to the outrage; they entered many of the houses and dragged the assailants out, he was at one period in great danger, a ruffian having presented a gun at him, the actual perpetrators of the outrage are described as being, for the most part lads in very ragged apparel; they were variously armed, some had fire-arms others old bayonets on sticks, some plough irons , one shot was fired in the house of Mrs CAMPBELL and three guns are stated to have been snapped at James M'GEARY; some wearing apparel, house linen, and money, were carried off and also two guns, one the property of Mrs CAMPBELL, which she had secreted on board a lighter, but was forced on oath to discover where it was; the other from the house of James M'GEARY a tenant of Colonel VERNER near the village, which house also received much damage; Mrs CAMPBELL was wounded in the head by a young ruffian with a rusty bayonet fixed on a stick, a quantity of spirits and ale was spilled in her house, but none drank. She keeps the principal public -house in the place; she and her daughter received much abuse. Several other persons were struck with the buts of guns and attempts were made to set fire to two or three houses, by placing lighted coals in the thatch and bedstraw. The party left the village about 12 o:clock and went off to the county of Tyrone with drums beating. Such are the facts elicited by the magistrates. Two questions now arise, first as to the means of discovering the delinquents of whom the persons who could be procured to give evidence, denied any knowledge whatever. When so many and such a description of persons were implicated it is scarcely to expected that all will be found proof against a good reward, and a promise of pardon on prosecuting to conviction, or giving private information which may lead to conviction if promptly offered by the Government. Secondly as to the district liable to be assessed for the damages as usual in cases malicious injury. It being quite clear that not an individual of the county of Armagh was in any way connected with the outrage; it would ill consist with justice to lay any burthen on that county and the query is as to the steps necessary to be taken by the sufferers in order to recover the amount of their losses from the county of Tyrone, from which the violators of the law openly and notoriously came. These considerations are respectfully submitted to the consideration of the Government. As some of the newspapers have introduced the name of the yeomanry into the very erroneous accounts of this affair, it is but justice to mention that there is not a tittle of evidence tending to implicate that force. Mr LLOYD who commands the Killyman yeomanry declared on oath that that corps has not any drums belonging to them nor did he know any of the persons concerned in the outrage. Compiled from and carefully compared with the evidence. (signed) William BLACKER Lieutenant-Col. J.P.